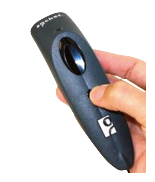 We recommend using an external Bluetooth barcode scanner to enter a number instantly, which will save you a lot of time. We suggest using the Socket Mobile 7Ci Bluetooth Scanner. It is compatible with Android, iOS, and PDA devices. You can purchase the Socket 7Ci Scanner on our website here. Here’s the video demonstration and tutorial for some of the popular scanners.